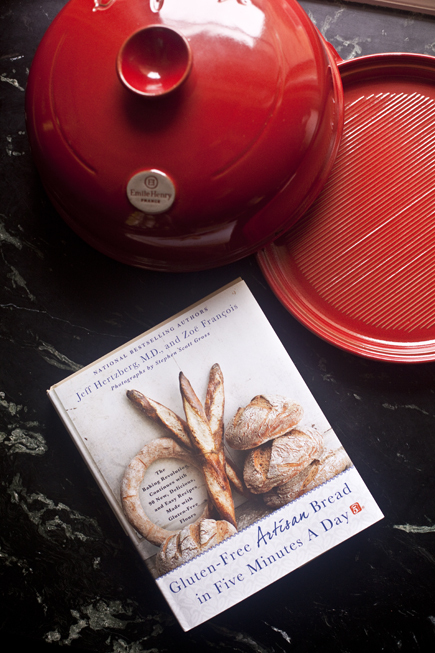 We are very, very excited about this NEW version of our first book, Artisan Bread in Five Minutes a Day. So, what’s new? It’s nearly 150 pages longer, with lots of new recipes, techniques, and WAY more photos (40 gorgeous color and 100 black-and-white instructional shots). 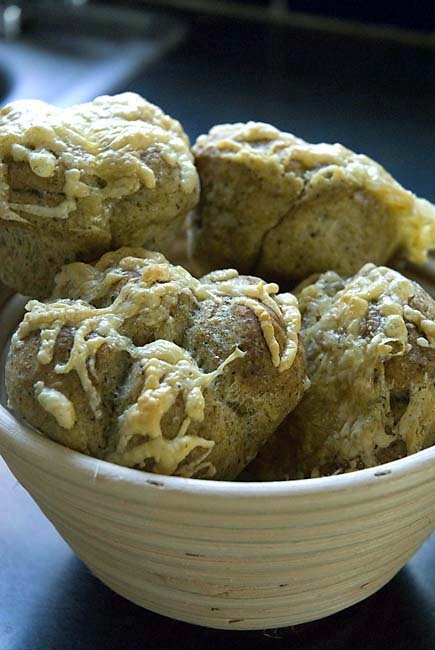 There are over 30 brand-new recipes and fun variations, including Crock Pot Bread, Pull-apart Rolls, Pretzel Buns, Stuffed French Toast, gluten-free breads, and lots more. All our old favorites are still there, and thanks to your suggestions, we’ve added weight measures to all the dough recipes in the book, both U.S. (pounds/ounces) and metric (grams). We’ve expanded our Tips and Techniques section, and included instructions for adjusting salt and yeast to your taste. As always, you’re pre-mixing dough that can be stored in your refrigerator for up to two weeks, so active time is still only five minutes a day. There’ll be much more to talk about in October when the book hits the stores, but we just had to give you a sneak peek at the beautiful new cover. Two years in the making, this sixth-anniversary edition of our first book–The New Artisan Bread In Five Minutes a Day–is available for Pre-Order from online sellers. If you pre-order, it’ll ship on October 22, 2013, which is the official publication date. Thanks for all the feedback you’ve given us here–it’s shaped the new book. Cheers! Gray color and liquid on my dough: Is there something wrong? 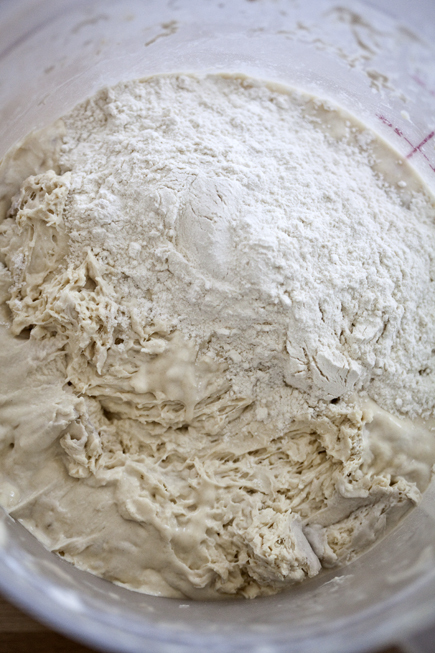 As your dough stores in the refrigerator, it might develop a uniform gray discoloration and liquid on its surface or at the bottom of the bucket. This is not mold* and can be safely ignored. Here are ways to deal with this dough. 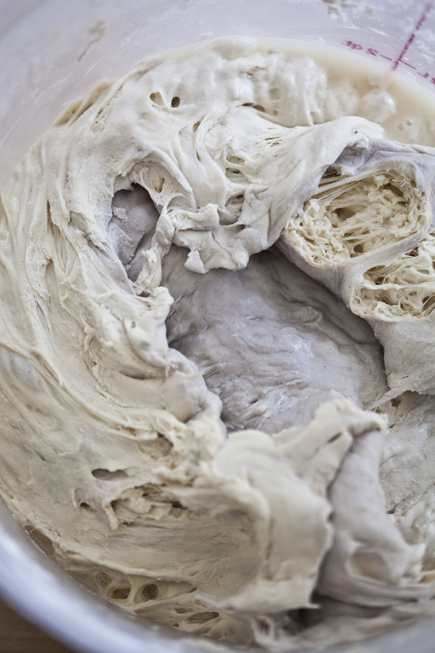 If you have a bucket of dough that was untouched for several days, it may develop a gray cast to it. As we mentioned this is safe to consume, but it may have a tough, almost leathery texture. 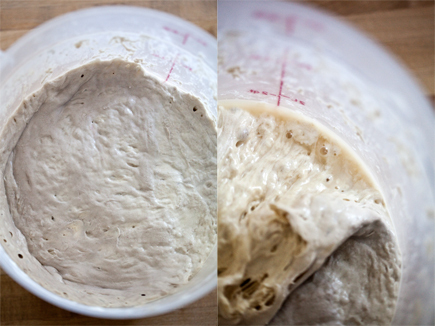 If the dough has become hard and leathery, that suggests that there’s too much air-space in your container (or that it isn’t sealed well enough). You can decrease the effect of air that gets into the container by transferring into smaller containers as the dough is getting used up. 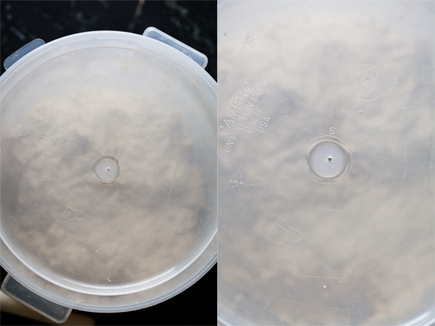 Another way to prevent too much air from getting into your bucket is to poke a small hole in the lid, that way you can snap it shut, but still let the gases escape. You can simply ignore the gray portion of the dough and form it into a loaf, but you will likely end up with a streak of gray in your dough and that area may be dense. If you’d prefer not to use the gray part, the dough underneath will be creamy in color and full of flavor, so you’ll want to use it. Just peel off or scoop up, depending on the texture, the gray portion of the dough. 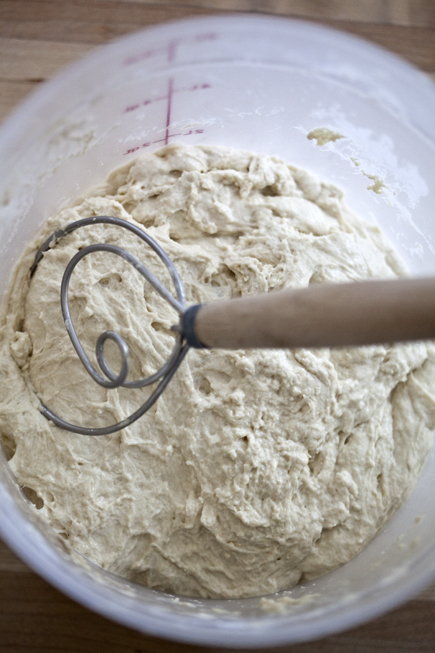 If you find liquid under the dough, which can happen if your dough has sat untouched for several days, just add enough flour to absorb that liquid and get your dough back to the consistency of the original dough. Mix in the flour and let it sit until the new flour absorbs all the liquid. It is now ready to use to make bread. 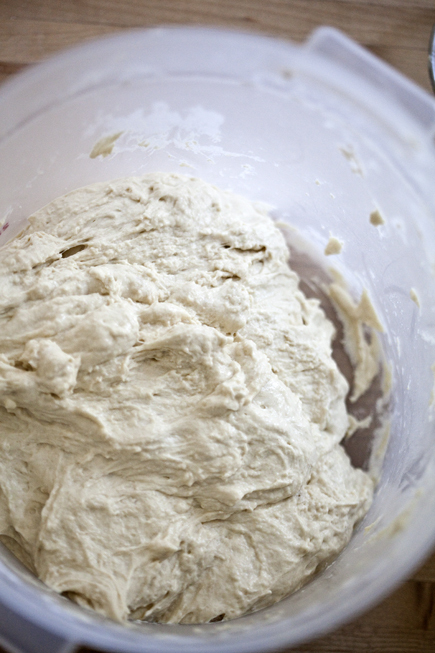 Click here to see Fresh Bread made from Older Dough. 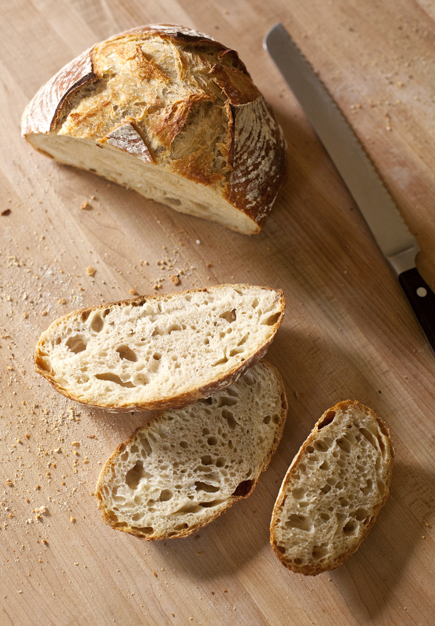 The dough may spread more than usual, but you will get a lovely loaf that is full of flavor. If you only have a tiny bit of dough left, even if it is gray and liquidy, you can incorporate it into your next batch of dough to jump-start the flavor in your next batch: Click here to find out how. *If you see patchy light or dark areas on your dough, whether smooth or fuzzy, that could be mold and the dough should be discarded. You are not likely to see mold if you follow our directions for maximum storage life, and keep the dough in the refrigerator.